First Appearance: Spawn #3 What's the Story? : Terry Fitzgerald always knew he wanted to give back to his country. He was a straight-A student from grade school to high school, and had his pick of Universities. He entered college with a dual major, Political Science and Slavic Studies. He met Al Simmons there, and he became Al's English tutor. Terry's expert skills kept Al on the baseball team, and together the double-dated the cheerleaders. After college, Terry's excellent grades and special studies landed him in a bidding war between five different government agencies. At first he opted for the FBI, but the training at Quantico proved too exhaustive and so he joined the CIA instead. There, he interpreted data from the Soviet block, and kept current by taking additional training courses. He ran into his old buddy Al during one of these excursions, a language immersion school in Monterey, California. They lived close to each other in New York, and became inseparable. Beyond his job and an interest in hockey, Terry had little personal life. He envied Al - his best friend had a beautiful wife and home in the suburbs - but work, service to his country, came first. He'd spent what weekend time he had a barbecues at the Simmon's home in Queens, but always had a book in his hand while Al was watching the game. It was a terrible shock to Terry when Al returned from a mission in a casket. At first, Terry would visit Al's widow Wanda, against his better judgment because he felt she needed the space. As it turned out, what she needed was him; a pillar of strength she could lash herself to. Terry helped Wanda and Granny through their time of grief, and chased away reporters looking for "just one more" quote from the widow of Al Simmons, the heroic Presidential guard. One thing led to another and soon, Wanda and Terry were married. He felt some guilt early on, but he wanted to see Wanda taken care of. To some extent, he was doing his friend this one last favor, but the love he felt for her surpassed anything he'd ever felt. Eventually, they had a daughter, Cyan, and the sting of Al's death faded. That is, until Als' ghost, or something like it, reappeared. 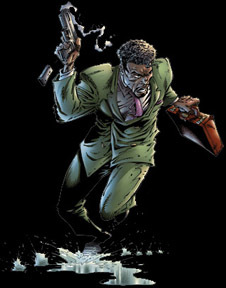 This ghost, Spawn, saved Terry's life several times and even tried to visit Wanda, perplexing Terry and reopening the wounds of his guilt and grief. Meanwhile, Terry's job had it's own ups and downs. His boss at the Agency, Jason Wynn, had him framed for some security breaches in their offices, and had Terry's family threatened. Though the facts proved Terry was not guilty, Wynn needed any victim to take the fall, so scandals would not stick to him. Terry eventually got wise to the situation and suddenly became the model employee. He transferred over to Wynn's office directly, there to have access to the man's files and bring him down. So now, and with the help of Spawn, Terry intends to protect his family the best way he knows: destroy the threat at the source.